The path strands riders here, on the north side of queen Avenue, far from the Geary intersection. 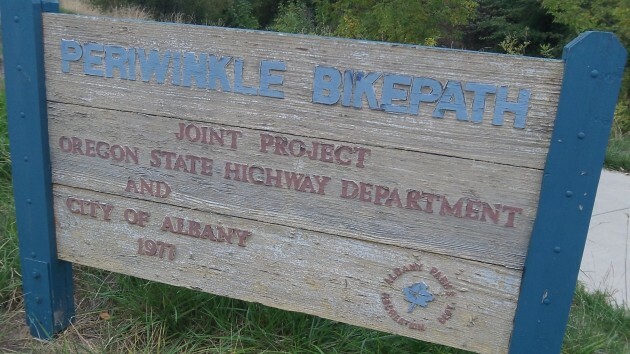 Back on the Albany bicycling front (a tranquil retreat from the renewed but fruitless gun debate), the good old Periwinkle Bikepath comes to mind. First, because it’s being lengthened, thus becoming a bit more useful for transportation. And second, because to become truly useful it still needs an intersection fix. The new section is being built along the creek channel on the east side of the Lowe’s home improvement center, reaching north to Ninth Avenue. This extends the path to the small shopping center at Ninth Geary and Arby’s restaurant, a potential destination for relaxed bike trips from the path’s other end in South Albany. Any relaxation on that fine old path, though, is rudely interrupted at Queen and Geary, a wide and busy intersection. Unless a cyclist dismounts and walks across as a pedestrian, getting across requires ingenuity, nerves of steel and a bit of luck. Either that, or riding against traffic (upstream, or salmoning) for a short distance, or crossing Queen in the middle of the block. From the southeast corner, too, the crossing looks forbidding. As it happens, the city’s 2010 Transportation System Plan calls for improving the crossing for cyclists on the Periwinkle Path. The cost was estimated (when the plan was prepared six or seven years ago) at $46,000, and the project involves some sidewalk widening. It was described as “short-term” when the plan was adopted, but as far as I can see it hasn’t been carried out. Getting across the intersection in traffic is still a challenge. 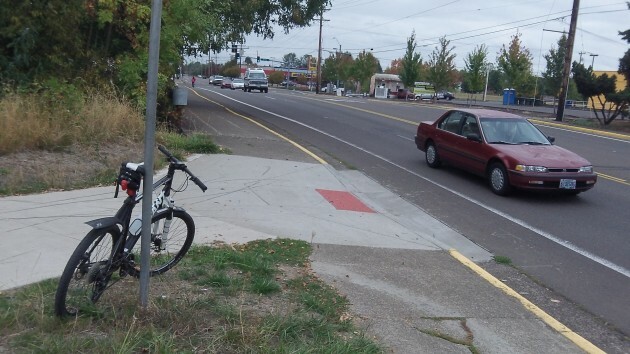 I wish the city’s Bicycle and Pedestrian Commission would get interested and push the city to get the planned improvement done, especially now that the north end of the path is being lengthened. The other day I speculated on extending the Periwinkle Path north of Ninth all the way to the Willamette River, which the transportation plan also calls for. The plan puts the likely cost at $1,528,000, but Ron Irish, Albany’s transportation system analyst, doesn’t think it’s feasible. He has looked at it and concluded there’s not enough room for a path in the culverts carrying the creek under two rail lines and several streets. Too bad. Users get this reminder, somewhat faded, of the path’s construction in 1977. Here’s an idea. It involves maybe 4 signs/posts and yellow traffic paint. The “Bicycle Corridor” (or something similar) signs would be posted maybe 1/2 block away from the Queen and Geary intersection on both streets in both direction as drivers approach the intersection, thereby putting drivers on notice to be aware and careful of bicycle traffic in that immediate area. The paint would be yellow and outline the two necessary paths to connect the two sections of the path, consistent with a legal traffic pattern. 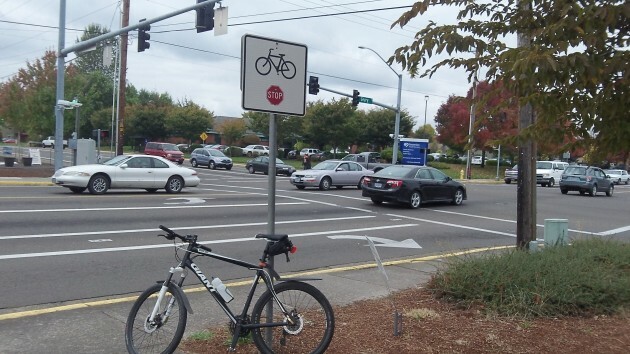 Of course bicyclists would still be required to stop at signals, etc, but at least a bike path could be outlined in this way to both: 1) caution auto drivers and 2) guide cyclists through a “safe, dedicated route” from one section to the other. In addition to the bike lanes, arrows could be painted as a further guide. Seems a reasonable, low cost solution to the problem you’ve noted and certainly an improvement to what is already there without spending a bunch of money on excavation and concrete placement. I find that intersection to be a minor problem compared to heading East on 9th Ave and trying to get onto Pacific Blvd.